Puerto Rico is struggling with a heavy debt load and weak economic growth. A bond sale is a crucial step to avoid bankruptcy. The final price has yet to be announced, but analysts say the bonds will come with an 8% coupon, or interest rate. The price will be discounted to produce a yield of between 8.625% and 8.875%. Bond yields rise when prices fall. If the auction is successful, it would rank as the largest tax-free debt sale ever, according to Alan Schankel, a municipal bond analyst at Janney Montgomery Scott. Schankel said preliminary reports suggest the offering was oversubscribed, meaning demand is robust. That should mean that the interest rate Puerto Rico will pay on the bonds will be towards the lower end of the range, he added. Puerto Rico seems to be targeting institutional investors, including hedge funds. The bonds have a minimum denomination of $100,000, compared with the typical municipal bond, which comes in $5,000 increments. Related: Is Puerto Rico the next Detroit? The sale is important because it could provide much needed liquidity for the financially stretched commonwealth, which is saddled with nearly $72 billion in debt. 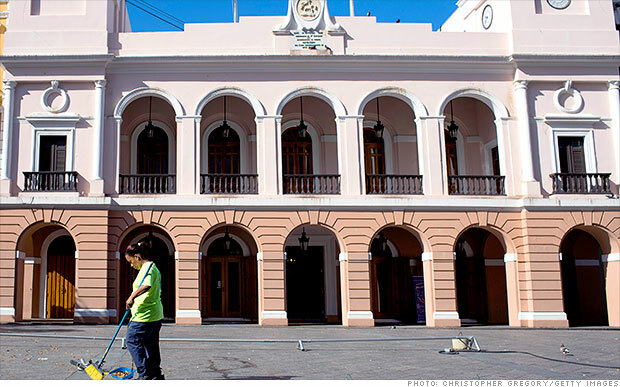 Puerto Rico has been struggling to pay its debts following years of weak economic growth. There has been widespread speculation that Puerto Rico could declare bankruptcy. Those concerns sent yields on Puerto Rican bonds to nearly 10% late last year. But the government has taken steps to get its finances in order, including controversial cuts to public pensions. San Juan plans to reduce spending by $170 million this year and hopes to have a balanced budget by 2015, according to Standard & Poor's. What's more, the bonds are structured in such a way that Puerto Rico will not have to make any principal payments on the loan for eight years, according to Schankel. Still, Puerto Rican bonds are considered highly speculative. In a preliminary statement released last week, the government outlined several risk factors associated with its debt. Risk number one: "The Commonwealth may be unable to honor its obligations to pay debt service on the bonds." So while the bond sale is a step in the right direction, it's clear that Puerto Rico is not out of the woods yet.